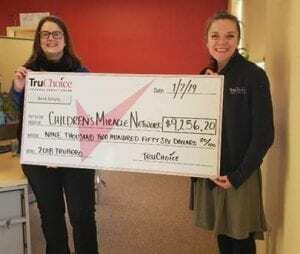 We’re so grateful that TruChoice has once again displayed unwavering support to BBCH in 2018. By continuing to invite members to sign up for a TruHero credit card, they have empowered cardholders to become our local heroes. Each time a TruHero cardholder makes a purchase a percentage is donated to BBCH — with no additional cost to the cardholder! In 2018 over $9,000 was raised! The TruChoice commitment to bettering our community makes a lifesaving impact on the children and families who rely on BBCH, year after year. Thank you, TruHeroes! Want to learn more? Click here to become a TruHero! Next post: Maine Family Federal Credit Union Does it Again!